This is the second in a series of blog posts entitled “Kickstart Your Diet!” that are designed to get you up and running on the LifehackrDiet. Please check out the series of posts Here. For more clarification on what the LifehackrDiet is and how you can be successful with it, please check out previous blog posts; What is the LifehackrDiet and Why Should I Care? and 3 Strategies: Quit the Gym and Be Healthier! and Secrets of Eating to Lose Weight. A fantasy? I say not. It will be your reality soon enough and this blog post along with others in the series will show you step by step how you can make that fantasy into your reality. Let’s Kickstart Your Diet! This week we are going to simply setup, record and observe. What does that mean? Like any new project we need to take time to ensure our success by planning and setting up the tools we will be using. I know you are anxious to get started on your weight loss journey, but this is an important step that will help you, ultimately, be successful – bear with me on this. This blog post “Kickstart Your Diet! Record” is the second installment in a series of three posts that are designed to get you up and running on the hardware and methodology of the LifehackrDiet. In the blog post “Kickstart Your Diet! Setup.” we did exactly that. We went over the types of smartphones, tablets and or computers you might be using as your central information processing hub. Next up was discussing the importance of having a digital pedometer so that all of our steps are recorded, the free apps you will use daily to store and synthesize your data and finally why a body weight scale is an important tool for the LifehackrDiet flow. This blog post will go over how to record your food consumption, exercise, sleep and weight all within the Fitbit app. We will detail the recording process and take into consideration that some of you will be waiting on your new Fitbit pedometers to arrive, and some will already have them. Once everyone has their digital pedometer I will outline the importance of recording a baseline of data for one week before we start making small changes to your lives, one of the core principles of the LifehackrDiet. 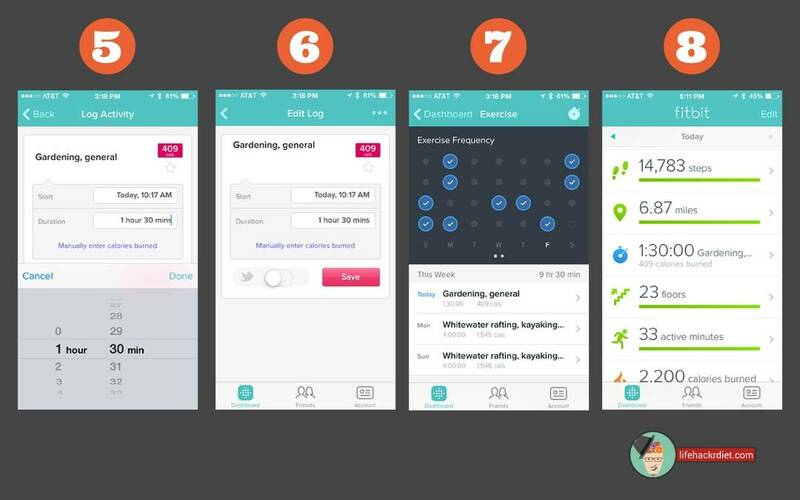 Let’s start the process of recoding your data within the Fitbit smartphone app (see more info on how and why to download here) I am going to play the sequence out in a chronological order, which should be similar to most people’s day. Clearly your sequence might be slightly different – feel free to move things around to fit your individual needs. Getting an adequate amount of sleep every night is very important to your overall health and well being. Not getting enough sleep has been tied to weight gain among other health issues. From now on using your Fitbit app you will be able to see this dynamic in action. You are about to embark on an adventure of seeing your body and how it functions in a totally different way. Data tells us many stories, we just need to read and understand them. Two out of the three Fitbit pedometers currently available (Fitbit One and Flex) have auto sleep recording functionality. The Fitbit Zip does not. Although the automatic sleep recording is very nice, you can still record basic sleep data manually if you forget to wear your One or turn on the sleep mode of the Flex. Open your Fitbit app (with a connected Fitbit One or Flex), from the main screen (Dashboard) scroll down until your see the quarter moon icon. Click on the icon and you will be presented with the Sleep Detail screen (see fig. 1 & 2 above). To manually start recording your sleep you can press on the “+” symbol in the top right of the Sleep detail screen. You will be offered a choice of either “Add Sleep Log” or “Begin Sleep Now. (see fig. 2 & 3 above)” The first choice “Add Sleep Log” is what you would use to manually input your bed time and your wakeup time. This is something you can do in the morning when you wake up or anytime that day when you remember. The input screen is self explanatory; you input your bed time and your wake up time and then press the “Log” button in the top right of the screen (see fig. 4 above). Your sleep duration will be calculated and recorded in your Fitbit Dashboard. The “Begin Sleep Now” option will automatically start your sleep timer and offer your “I’m Awake” button (see fig. 5 & 6 below). Now you can turn off you smartphone screen and go to sleep. When you wake up, simply turn on your smartphone screen and press the “I’m Awake” button. 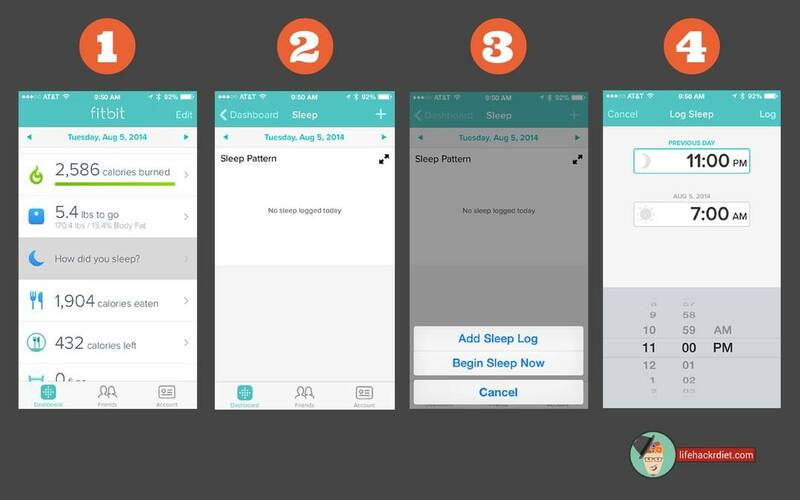 The Fitbit app will calculate your sleep duration and show you the data on the Dashboard. You can use either of these options or mix and match based on your preference or circumstances. Using the included wrist strap, place the the Fitbit One in the pouch by sliding it through the opening on one side. Secure the wrist strap to your wrist (it needs to be pretty snug) and then I rotate the strap to that the pouch opening is on the side of my wrist so that the opening is choked off. When you are ready for sleep press and hold the thin raised button on the Fitbit One until you feel a quick vibrate and a stopwatch appears on the screen. Let go of the button and the display will go dark in a few moments. It is now recording your sleep/awake and restlessness. When you wake up simply repeat the process of pressing the button and waiting for the vibrate alert. Now when you open the Fitbit app on your smartphone (and it synchronizes) you will see you sleep duration and all the other statistics about the quality of you sleep (see fig. 7 & 8 above). There have been nights when I feel like I’ve had a really bad night’s sleep and the data reflects that, but it wasn’t nearly as bad as I thought it was, I was just being a baby! The Fitbit Flex will already be on your wrist as that is how it is worn so all you have to do is tap the Flex unit rapidly for one to two seconds (sometimes three). Your Flex will vibrate and display two slowly dimming lights to indicate that you have entered sleep mode. When you wake up repeat the rapid tapping sequence. When it exits sleep mode, your Flex will vibrate and flash all five LED indicator lights three times and then display a spinning light pattern. 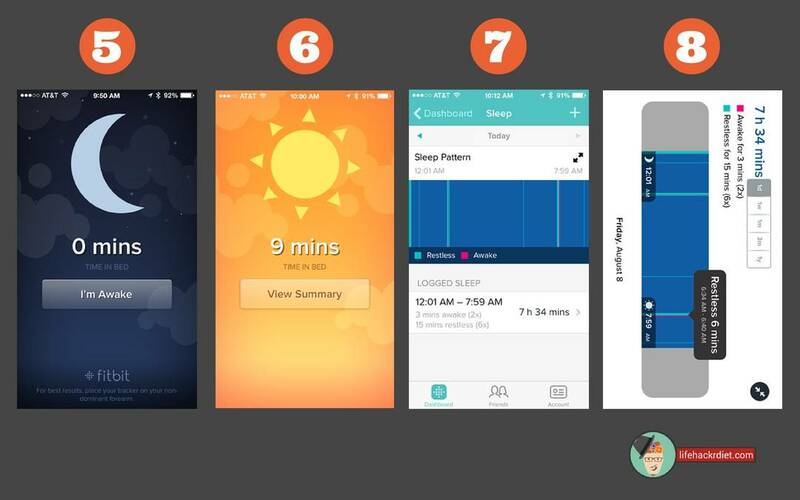 Now when you open the Fitbit app on your smartphone (and it synchronizes) you will see you sleep duration and all the other statistics about the quality of your sleep (see fig. 7 & 8 above). I know that weighing yourself every day can be stressful for some people, but I invite you to look at these numbers as data points in a “project” and not “your” daily weight/body fat reading. One day doesn’t matter, progress towards your goal does! There will be more good days than bad days and you will see the trend line flow downwards towards your goal. If you weigh yourself daily then you will have an accurate data picture to look so that you are able to make smart decision about food and exercise that get you to your goal. Using the EatSmart Precision GetFit Digital Body Fat Scale or your existing scale will require that you add you body weight and body fat numbers to the Fitbit app manually. This is a simple process, the most difficult part is keeping the two numbers in your head (within minutes of waking up) long enough to put them into your smartphone! Tips: It’s best to weigh yourself right after getting out of bed in the morning, but be sure to expel any excess liquids or solids first (go to the toilet first!). Also I would recommend standing on the scale with as little clothing as possible (your birthday suit is ideal). It is important that any scale you use is flat on the floor before you stand on it to ensure an accurate reading. Once the Eat Smart scale locks on your weight, it then calculates your other statistics like body fat percentage and body water, body muscle and bone mass. Remember you weight and body fat numbers and open the Fitbit app on your smartphone. On the dashboard scroll until you see the weight scale icon and select it (see fig. 1 above). You are now on the Weight screen and you can manually input your data by selecting the “+” symbol at the top right of the screen (see fig. 2 above). Input your two data points and then select the “Log” button in the top right of your screen (see fig. 3 above). You can now see your data points recorded with the word “Manual” to the right of the numbers (see fig. 4 above). Select “Dashboard” on the top left of your screen and you will be taken back to the Dashboard. Getting your weight and body fat numbers from the Fitbit Aria (once you’ve set it up) into the Fitbit app, are quick and easy – your eyes don’t even need to be open! Simply step on the Aria scale (please read the “tips" in the section above) and let it calculate and lock on to your weight, BMI and body fat readings. 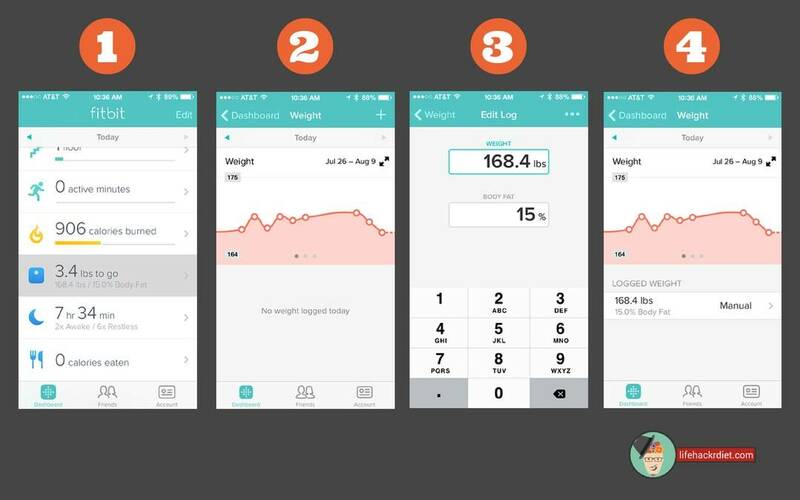 When you open the Fitbit app and it syncs, your data will appear in the Weight section of the Dashboard. That’s it! One of the main principles of the LifehackrDiet is to keep moving and even utilize everyday chores as a way to keep active and burn calories (see 3 Strategies: Quit the Gym and Be Healthier!). This is more easily recorded using a Fitbit digital pedometer but can also be pieced together by manually recoding your activity in the Fitbit app. While you are waiting for your Fitbit digital pedometer to arrive, you can get used to recording your activities, burning calories and building a baseline for moving forward with the LifehackrDiet. Go do something! Walk, run. go workout, paddle a kayak, do some gardening – anything! Take note of your start and end times and calculate the duration of the activity. When you are done, open the Fitbit app on your smartphone and from the dashboard select the Stopwatch icon with the text “No exercise today” (see fig. 1 below) – we are about to change that! You will be taken to the Exercise summary with a graphic representing your Exercise Frequency. Select the Stopwatch icon in the top right of the screen (see fig. 2 below) and a new screen for Tracking and Logging your exercise will appear (see fig. 3 below). If a dialogue box appears on your screen, just select “OK” for now as we will be dealing with that later. Now select the word “log” at the top of the screen and the white slide should now move over behind the word “log” (see fig. 3 above). 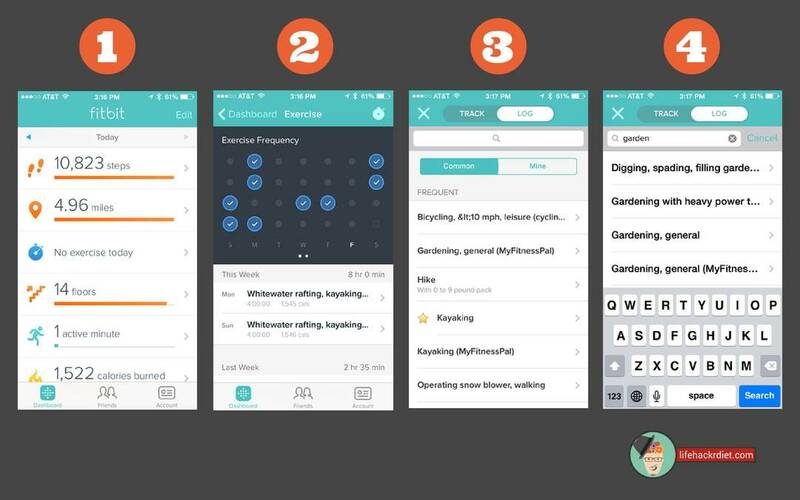 Just below is a text entry field, tap it and start typing the keyword of your exercise (see fig. 4 above). For most typical activities at least one if not several choices should appear in a list below the text entry field. Select one that is the closest fit to your activity and you will be taken to detail screen with more information (see fig. 5 below). If you want to select another activity from the list, simply select the “Back” button and you will be returned to the list. Once you are on the detail screen of your choice you an enter the information requested. The start time doesn’t have to be exact so input whatever information you have. When you are done select “Next” and input the duration of the selected activity and then select “Done” to finish up. In the red box at the top right of your screen you will see an amount of calories that Fitbit believes you burned during that activity/duration (see fig. 6 below). If you disagree you can simply change the calorie amount by selecting the text “Manually enter calories burned” mid screen. Now you can alter the calories burned count for that activity. When you are done, select the “Log It” red button and you will be taken back to the Fitbit Exercise summary screen (see fig. 7 below). Please note that by adding more calories to the activity in the Fitbit app, you will not make your body burn more calories than it did during the activity. Only adjust the calories if you are sure that what you did, burned more or less than what the Fitbit app suggested. You can’t fool your body! The Fitbit app for most non-smartphone devices (computers, laptops and some tablets) does not support this functionality as it uses the GPS chips inside your device to record and measure your walks, hikes or runs using the “Track” functionality. This is a really cool feature, but be warned depending on your device, it could use more battery power than an average app on your device. As you are about to start your walk, hike or run select the Stopwatch icon from the Fitbit Dashboard to be taken to the Exercise summary screen (as described in the “Log” section above). Next, select the Stopwatch icon at the top right of this screen. By default you should be in the “Track” screen/function (see fig. 1 below). If a dialogue box appears on screen that indicates your device only has wifi (and not a navigation chip) and the results may be erratic, then its best that you log your activity manually as described above. If you are ready to start your walk, run or hike press the big red start button on the screen and the active Tracking screen will appear (see fig. 2 below). When you are done your activity, select the big red button (now with a pause icon in the center) and then hold down the “Finish” button until the green flood animation fills your screen. Now you should see a summary screen with a map and your route plus stats visible (see fig. 3 below), congratulations! Your walk, run or hike has now been recorded in the Fitbit app and you have been awarded the calories burned (see fig. 4 below). Once your Fitbit pedometer is connected to your smartphone (or devices listed here) all you need to do to is let the app sync with your Fitbit pedometer for all your data to upload to your app and subsequently the website. If you want to track walks, runs or hikes using the “Track” or “Log” functionality described in the “Manual Recording” section above you can do that as well and Fitbit is smart enough not to double your recorded data (sorry, nice try!). The Fitbit pedometer only records your steps so if you are gardening, at a yoga session, stand up paddle boarding or any other activity that is more than just steps you should manually record those activities as described above. If you own an iPhone 5s or later model, the chances are your smartphone contains the M7 coprocessor chip which will record most of your activities with out the need of an external pedometer. Remember that you must have your iPhone on your body at all times for it to record your every movement during the day. All you need to do is to open the Fitbit app (once you have selected the M7 coprocessor as your device in the setup process) and let it sync – your data will then be up to date. If you want to track walks, runs or hikes using the “Track” or “Log” functionality described in the “Manual Recording” section above you can do that as well and Fitbit is smart enough not to double your recorded data. The M7 coprocessor only records your steps so if you are gardening, at a yoga session, stand up paddle boarding or any other activity that is more than just steps you should manually record those activities as described above. What you eat and drink, how much of it, all has a direct effect on your body weight, fat index, your overall health and wellbeing. We all make dozens of decisions a day that have an impact on our health. Some are conscious but for most we are “checked out” when we make them. The LifehackrDiet will show you how to take control of those decisions and learn to make them with your health and wellbeing in mind. By recording what you eat you are deciding to take responsibility for your actions. Your good habits will shine and the bad ones can no longer lurk in the dark, it will be sunshine all around! Eating the right foods in reasonable quantities is important for your health, weight-loss and wellbeing. The approach of the LifehackrDiet is not to change things up all at once, but rather start with your favorite foods and make small changes that over time lead to huge results. For more information and some ideas of how to do this, be sure to check out the blogpost Secrets of Eating to Lose Weight on lifehackrdiet.com. By recording what you are eating with the Fitbit food diary you are taking responsibility for every morsel of food that passes your lips. Open the Fitbit app on your smartphone, you should see the Dashboard screen. Scroll to the knife and fork icon “Calories Eaten”, and select it (see fig. 1 above). You are now in the “Food” summary screen where you can see your stats for the past week, an update on how you are doing for calories out and in for that day, and finally a list of food items you have logged for the day (see fig. 2 above). To add a food item to the diary, select the “+” icon in the top right of the screen and you will see the “Log Food” input screen (see fig. 3 above). Assuming that this is the first time you have input food items to the Fitbit app there will be no items listed under the “frequent” or “Recent” categories. If you have logged before then you can input your items much faster using these pre-populated lists. To log a single food item, manually, just touch anywhere in the “Search” text field and your devices’ virtual keyboard will become active. Start typing the name of the item (as an example “apple”) and you will see a list of all the apple items in the Fitbit app’s database listed below (see fig. 3 above). Start scrolling until you find the item that most closely matches what you are looking for and select it. If you go out to eat or you prepare a homemade meals, it would be very time consuming to input each and every ingredient into the food diary, and frankly, a little obsessive. Good news, I not here to make you crazy! You can search for dishes in the Fitbit food diary too. For example if you went out to a Vietnamese restaurant and had a portion of “Shrimp Spring Rolls” you would not have to put in every ingredient just search for it; “Shrimp Spring Rolls” (see fig. 5 below). The result won’t be the exact calorie count of the ones you are actually eating but they will be in the range (see fig. 6 below). If your home garden is exploding with ripe tomatoes and cucumbers and you decide to make a batch of Gazpacho soup, search the term and you will find plenty of options to choose from. Sometimes you will have to get a little creative with recording meals, but remember it’s better to over record your calories since you can’t cheat your body/metabolism. The next day or two you will be pleasantly surprised, when your weight inches down. The Fitbit app takes advantage of your smartphone’s camera and can use it as a UPC barcode scanner (see fig. 7 above). 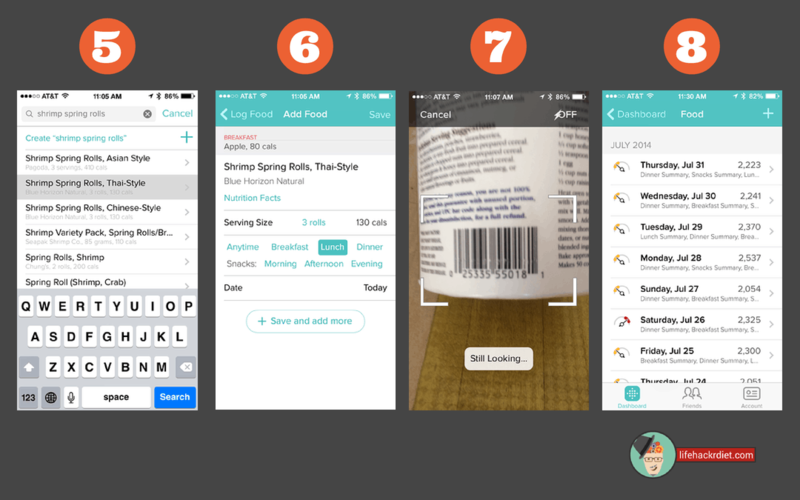 This functionality allows you to simplify the food/meal item(s) entry into your food diary. There is one caveat; your food items needs to have a barcode. This works well for packaged items, frozen goods, frozen prepared meals and snacks. 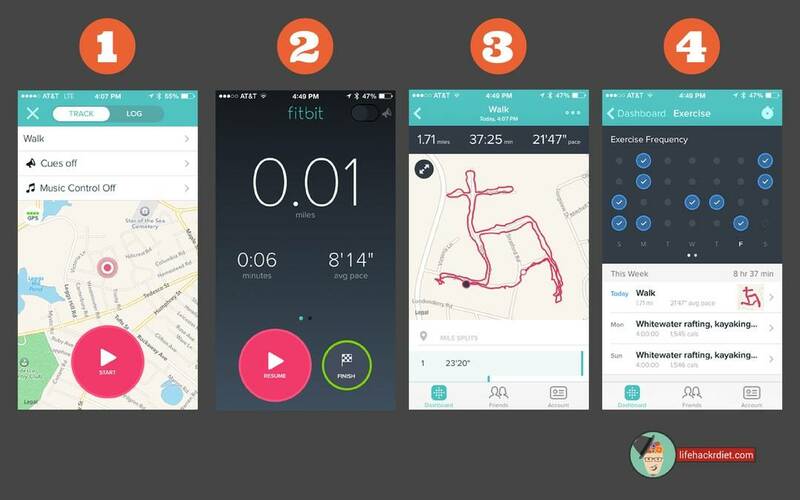 Open the Fitbit app on your smartphone (or tablet), you should be on the Dashboard screen. Scroll to the knife and fork icon “calories eaten” select it (See fig. 1 & 2 above). You are now in the “Food” summary screen. To add a food item to the diary, select the “+” icon in the top right of the screen and you will see the “Log Food” input screen. To the right of the “search” field you will see a barcode icon, select this and the app will engage your camera and it’s barcode scanning module (see fig. 7 above). Now move the barcode of the object you want to scan so that it fits just inside the guides on screen. When the Fitbit app registers seeing the barcode, the guides will turn green and a moment later you should see the results of the scan in the “Add Food” screen. Adjust the serving size, which meal and if you need to adjust the date/meal. When you are done adjusting the data, select the “Save” button at the top right of the screen to record your item and return to the “Food Summary” screen. Here are 4 shortcuts that can help you input your food data quickly and efficiently. From the Fitbit Dashboard select the “calories eaten” panel to be taken to the Food summary screen. Tap the “+” icon in the top right of the screen and you will be on the “Log Food” screen. Frequent – As you manually add or scan items into your customized food diary, the list of items below the “Frequent” tab will grow. Now you can either quickly scroll to find a favorite item or start typing the name of the item in the search field. Items that you eat frequently will gather on this Frequent list for faster entry. Recent – Items that you have recently selected or added to your food diary will appear in this list. If I am eating my way through some leftovers, I can usually find them listed here. Custom – If you have searched the Fitbit food database by either text entry or scanning and you aren’t able to find the food item, you can select the “Custom” tab and manually enter the product’s nutritional information. By tapping the “Add Custom Food” icon you will be taken to the “Create Food” screen where you can get access a simplified version of the nutritional information fields. If you would like to put more nutritional information into the database, tap “Switch to detailed View.” To return to the simplified view scroll to the bottom and tap the “Switch to Simplified View” and you will be brought back to the basic info fields. To save your newly entered food into the Fitbit food database, tap “Save” in the top right of the screen. Add Calories – If you are in a hurry or simply want to quickly add calories to your food diary you can do so by tapping the “123” icon, at the top left of the “Log Food” screen. You can quickly add the number of calories consumed via a number pad. Tap the “Save” icon at the top right of the screen to record your entry and return to the main food summary screen. Keeping hydrated is a very important factor in keeping you health on a daily basis. Drinking water is also a useful tool when you are dieting. Drinking a glass of water before every meal or snack helps to reduce the amount you need to consume to feel satisfied. Whichever way you look at it, drinking at least 8, 8 fl. oz. glasses of water (64 fl. oz.) is the least you should be aiming for. 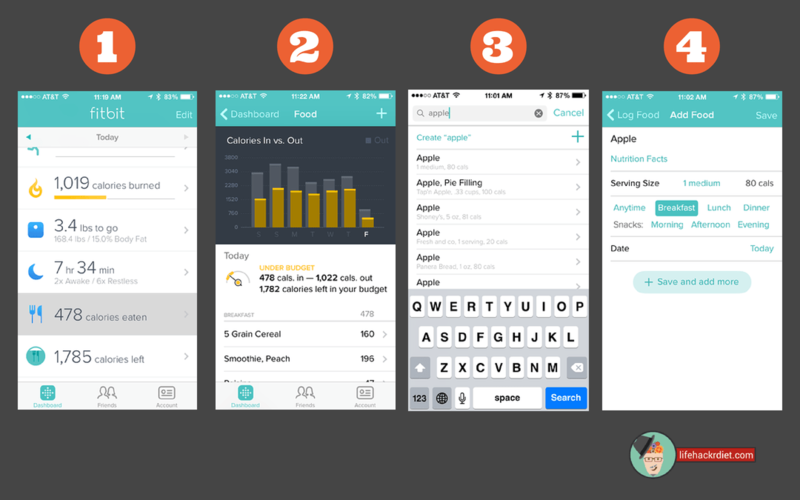 The Fitbit Food Diary can help you by making it really easy to record and track your consumption. 1. Tap in the large text field beside the standing person icon and your device’s number keyboard will appear allowing you to manually input the number of fluid ounces you have consumed. Tap “Log it” to enter the amount into your diary (see fig. 2 above). 2. Touch and hold the silver button and drag it to the right until the number of fluid ounces you want, appears in the text field above.Tap “Log it” to enter the amount into your diary. 3. Tap on the glass/bottle icons that represent the amount of fluid ounces you want to record and then tap “Log it” to enter the amount into your diary. Select the “Dashboard” button to return to the Fitbit dashboard where you can see your statistics summary (see fig. 4 above). You will see your current water consumption status included in the list. One of the ways the Fitbit digital diary helps you lose weight (behind the scenes) is that once you set up your goals, it shaves off a corresponding number of calories from your daily allowance. So if you have a 1000Cal allowance for the day, the app takes off 250Cal (Easier plan intensity) so you actually have 750Cal remaining. That 1000Cal is the amount you could eat to keep your weight static, the –250Cal ensures there is a downward trek for your weight. Higher intensity plans increase the calorie deficit and although you might be tempted to crank up the intensity in an effort to lose weight fast, it most likely won’t work! We are creatures of habit and our metabolisms are programmed to keep us alive – big changes often don’t work the way we expect. From a psychological perspective we don’t adapt well to large, sweeping changes to our lifestyle and we fight to get back into our comfort zone. From a metabolic perspective our body reacts in a defensive manner when experiencing a large, lasting calorie deficit as it tries to hold on to a fat reservoir to keep us alive. Crash diets rarely work for very long and are not healthy. – LIGHT calorie deficits so as to not freak out your metabolism. – Making all these small changes over time so they BECOME your new lifestyle. -When you reach your goals, you don’t need to diet anymore because you’ve reinvented your lifestyle. Now with all of that in mind lets setup a Food Plan that will get you to your goal and keep you there. If you have already setup a food plan and want to make changes, please see “Goals and Updating Your Plan” below. If you have not already set up your food plan go to the Fitbit Dashboard, scroll until you see “Start a food plan” with a plate and cutlery icon. 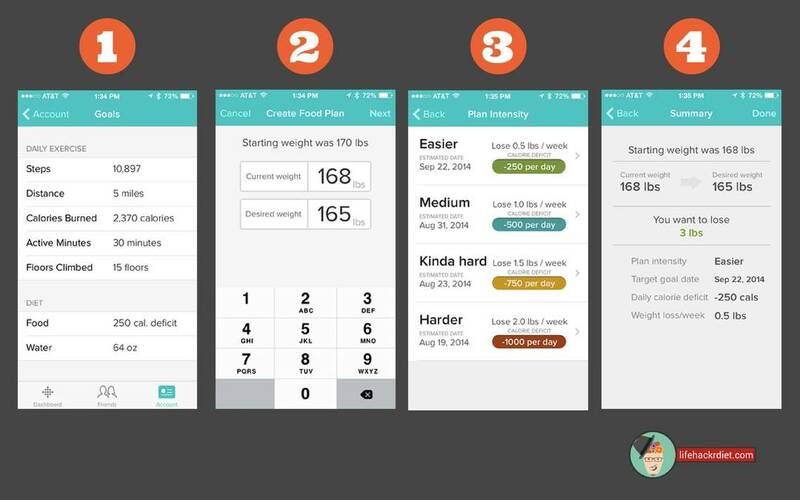 Select it and you be taken to the “Create Food Plan” screen where you need to enter your starting weight (what you weigh now) and your goal weight (see fig. 2 below). You can change your goal weight at any time so you might want to consider a staggered approach and select your first goal weight. Once you hit that weight, you can celebrate and then lower it again. Repeat until you reach your final weight goal. When you have entered these numbers press “Next” at the top right of the screen. As discussed above, there really is no point in rushing your weight loss as we are working on making permanent change in your life. You are going to be making lots of small changes to your life, so I would suggest until you get the hang of this change-y thing, start with the “Easier” plan intensity setting (see fig. 3 below). You should see an estimated date for when you will hit your goal weight (see fig. 3 below). Don’t freak out if this date is further out than you expected – remember permanent change! You will also see, once you are knee deep in your LifehackrDiet journey, that this date is a moving target and it doesn’t really matter because you are seeing positive change every day. Read through the information on the “How it works” page and you will see “Calories you can still eat today:”. This number will be constantly calculated based on your digital pedometer steps reading, your manually added Activities and the Food you are logging in your food journal. Select the “Next” in the top right of the screen. You will now see a summary of the choices you made (see fig. 4 below). The Dashboard of the Fitbit screen summarizes your daily data and uses a progress bar and it’s color to represent how close you are to each of your daily goals. This functionality is purely eye candy and a way of helping you sustain your motivation throughout the day. You don’t have to set these targets, or you can change them after the “observation” period, when you have an idea of what you can achieve. Feel free to play with this daily goal feature as much as you like. 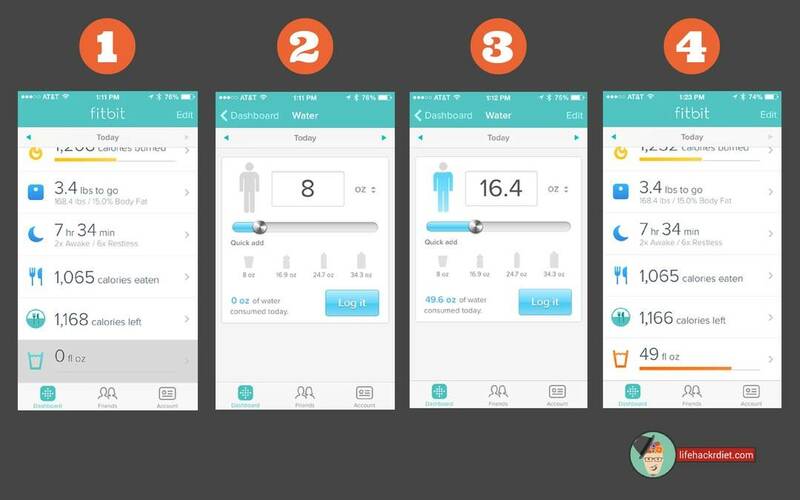 From the Dashboard screen of your Fitbit app, select the “Account” icon in the bottom right of your screen (see fig. 1 above). Once you are on the “Goals” screen you can tap on any of the existing numbers to bring up your number keyboard and adjust the goal (see fig. 2 above). You can also edit your “Diet Plan” from this screen by tapping on the currently displayed “Food” and calorie deficit number (see fig. 1 above), which will lead you through the “Food Plan” sequence (see fig. 2, 3 & 4 above) as discussed above. This screen also allows you to set your goal for daily water consumption (see fig. 1 above) which will be reflected on the Dashboard summary page and the detailed water logging page. Remember a great goal to start off with, is 64 fl. oz. An overview of what recording your data means. How to record your sleep data manually and automatically using the Fitbit app and pedometers. Recording your Body Weight and Fat Percentage data both manually and then reviewed automatic recording process. We took a look at how to record your Exercise and Activity data manually using logging, tracking and then how to do it automatically. Food and water recording was reviewed along with shortcut techniques; meals, scanning and the use of frequent and recent personalized lists. Finally, we went into detail about the Food Plan, how to create one, which ones to choose and why, and how to update your plan as you progress. That concludes the RECORD section of the “Kickstart Your Diet! blog posts. Please check out the other Kickstart Your Diet! blog posts to continue with your LifehackrDiet.